Outdoor advertising takeovers don't stay up long. With and interest in keeping their product in public view, outdoor advertising companies regularly check up on their inventory to remove potential vandalism, unintended use, or in this case outright critique. This has always been a problem for me and one which I have yet to fully get around. In light of this I propose the Let Me Handle This project in collaboration with New York City and Philadelphia outdoor advertising firms. Here's the deal. 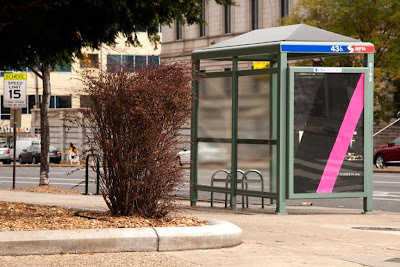 I have taken 3 advertising locations in Philadelphia as my own media sites. One is a MetroFuel location and the other two are bus shelters. I ask nicely that the companies who would potentially remove my work leave these 3 pieces intact until my exhibition comes down December 3rd. The visibility and minimal disruption to the industry as a whole I feel makes this a small favor to ask of an industry that has bombarded my environment with its own messages for as long as I can remember. While my request is unlikely to be met, I propose a little friendly competition between New York and Philadelphia be the result of my works removal. For each piece removed in Philadelphia, two pieces will be put up in New York. The same goes for pieces removed in New York, each removal resulting in two more images being put up in Philadelphia. This process will continue until my show ends December 3rd. If the imagery stays up in Philadelphia, no more work will be made, but if the work is removed, New York will be given the opportunity to end the cycle by leaving all six resulting images intact. If New York chooses to remove my work, Philadelphia's initial response will result in 12 images being placed on their streets, and so on until December 3rd. To me the obvious choice would be to simply leave these small disruptions up for a month and continue with business as usual. In this way I might be able to come to some unspoken agreement with those who control media production in our urban environments while maintaining my own abilities to critique that very system. What is more likely to happen is that the images will be removed and the resulting multiplying affect of those actions will make the critique more visible. As my work is ultimately about questioning outdoor advertisings role in our public environment, the more visible the project the more likely large numbers of people will engage this question. More people pondering outdoor advertising's role in our public spaces can only help further a debate that is so often overlooked in our media saturated lives. Watch the ongoing progress of the Let Me Handle This project HERE.